When we were researching for wedding cakes we had a little bit of a hard time because I myself enjoy baking. And for that reason my wedding would have to be extra delicious and unique. I knew I would have to find an amazing cake. That's when we became across Chantel & Bella. While arranging our cake taste we realized that she also did wedding floral arrangements. What an amazing duo I thought!!! Not only were our guest pleased with the cake but they were mesmerized with my wedding bouquet. Chantel's beautiful work was portrayed in the lovely bouquet she created for my special day. 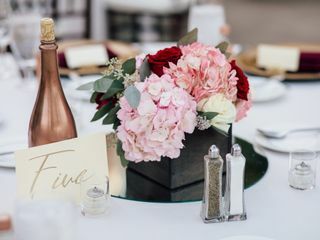 The combination that she came up with was wonderful as well as the table arrangements. I highly recommend Chantel if you are looking for quality, she was easy to work with and super helpful! Janet, Thank you so more for your thoughtful words! You & Husband were an absolute pleasure to work with. I couldn't be happier for you both!!! 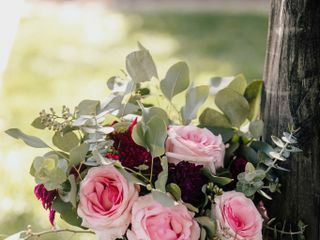 It was such a gorgeous wedding! Cheers to bright and everlasting future together!Hope to work again soon! Chantel's cakes are amazing! I am not a huge sweets person, so my husband was the one really making the decision on the cake and out of all of the samples, we had such a hard time choosing! They were all baked to perfection with flavors ranging from the standard to a few more exotic flavors. I love supporting smaller, local vendors and I really felt like we hit the jackpot with Chantel. We ordered a 3 tier cake without decoration and then realized that we didn't have anyone to decorate the cake day of! We left the flowers near the cake table and when it was finally presented to us the night of the wedding, I couldn't have been more pleased. 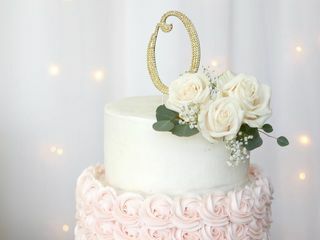 Chantel did not have to go out of her way to decorate the cake with the flowers and it was just such a simple, sweet gesture that makes me want to share her info with everyone I meet. She will be at the top of my list for the next event I throw! Chantel was amazing! She was extremely friendly and provided a delicious and cute cake tasting experience! Her almond cake is to die for! I can't wait to get my cake cake for my wedding! Her designs are so beautiful! We ordered our wedding cake along with 4 dozen rose cupcakes from Chantel&Bella. Everything was amazing from start to finish. Her signature "rose" design is so gorgeous! All our guests raved about how amazing everything was! Thank you! Chantel was amazing to work with. The cake was so beautiful and delicious... exactly what we requested. So many of our guests keep asking us who made the cake! That's how good it was!!! Thank you for everything!!! So happy we chose Chantel&Bella to do our cake. Everything was absolutely perfect. We ordered a 2 tier almond cake with raspberry filling, it was so delicious and exactly what we wanted. I loved everything about our dessert bar! The cake, the rose cupcakes & the cakepops! Everything was so adorable and exactly what we wanted. Chantel was amazing to work with and made the wedding planning so much easier on us! I heard about Chantel&Bella's cakes from my friends wedding! 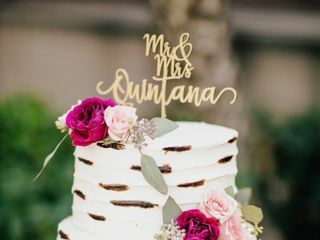 I loved their cake so much I had to know who made it and have it for my own wedding! Chantel is very sweet and professional. Her cakes are so delicious and beautiful. I even ordered 6 dozen cake-pops for wedding favors and can't even explain how cute they were! She individually wrapped each one and tied matching ribbon to them fro us. She went above & beyond. Everything was perfect!! We did about 6 cake tastings in LA, and Chatel&Bella's was by far the best. She even does pickup tasting which i loved becasue my fiance (now husband!!) got to enjoy it late at night after dinner. Chantel was amazing so her communication was spot on. We ordered a 3 tier cake, each tier a different flavor: almond cake with raspberry, red velvet & lemon cake with a lemon curd. All I can say is YUM. Will definitely use again when we need cakes! Our cake from Chantel&Bella was absolutely amazing! Chantel was so easy to work with and so nice!! It was so hard to choose a flavor from her tasting. 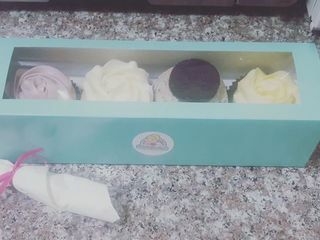 We loved all the selections she had to offer so we ended up picking 2 flavors for our 2 tiered cake and 2 flavors for our cupcakes. She was so accommodating and met all our picky needs hehe Will definitely recommend to all my family & friends. Thank Chantel! We had Chantel and Bella make a beautiful semi-naked, flower topped, smash cake for my daughter’s first birthday. It was exactly as I’d pictured and they even dropped it off the morning of the birthday party. We would absolutely use them again.